In our society, we have the tendency to root for the underdog. It’s an innate trait drilled inside of us that causes us to dig deep inside to see the most unlikely situation come true right before our eyes. It’s a reminder that the normal guys can too achieve big-time dreams typically reserved for the cream of the crop. For Rudy Griffin, he reminded not just kids who had big dreams to play for Alabama, but every young boy or girl who was told they would never be good enough to play at the highest level due to whatever perceived limitation they had. The road to get to The University of Alabama was quite unconventional for Rudy. From Hepzibah, Georgia, all Rudy ever wanted to do was play football for Alabama just like thousands of kids everyday. The path, however was difficult. For two years, Rudy suited up for The Citadel and started his freshman and sophomore year but something inside of him would not allow him to continue without setting out to accomplish a goal he had since he was a child. That goal, was to play for the Crimson Tide. Part of Rudy’s reasoning for playing for The Citadel was due to then-head coach Ellis Johnson being a former defensive coordinator for the Tide in the 90’s. To Rudy, he wanted to get as close as possible to playing for Alabama, and according to him, “What better way than to play for the man who actually coached at Alabama.” However, that dream was too huge to ignore. The constant what ifs urged Rudy to take a leap of faith and march into Coach Johnson’s office and explain there was some business he had to attend to and he had to set out on a path to achieve a childhood dream. Even at the behest of Johnson, Rudy left The Citadel and enrolled at The University of Alabama in 2003. If you’re thinking to yourself this story sounds oddly familiar to another guy named Rudy — you’re correct. The most unlikely of circumstances that a kid named Rudy who had a desire to play football at his childhood dream school was a Hollywood script that inspired thousands of people to never give up on their dreams. Rudy Ruetigger became famous for his compelling story of walking on to the Notre Dame Fighting Irish football team as a 5-foot-6 defensive end. While Griffin was bigger and taller than Ruetigger, he too was considered too small to play SEC football and was even scorned by his former Citadel coaches for even considering the notion. He himself stood about 6-foot weighing slightly over 285 pounds. Typically, an SEC defensive tackle more than likely is standing at a minimum of 6-foot-2 and pushing upwards of 300 pounds. For Rudy, he didn’t view his stature to be a disadvantage, but more so to his favor due to his ability to gain leverage on taller offensive linemen. Just like Ruetigger, Griffin battled daily on the Alabama scout team and wanted to do everything in his power to make a name for himself. For him, it wasn’t enough just to wear the Crimson Tide jersey. No, he believed if he outworked others, he would force the coaching staff to give him an opportunity, or he would do whatever in his power to conflict pain on the scholarship players he was helping to prepare for the next game. According to Griffin, “I would not stop going hard. I wanted to continue fighting until a coach literally told me, ‘Rudy, you need to stop. '” His efforts did not go unnoticed, and after a chewing out by Coach Mike Shula for disrupting an offensive play, Griffin’s scout team coach made it known he was doing a stellar job. Still, through all the hard work, sacrifice, and long days as a scout team participant — Rudy was left without an offer, and a tough decision to make. With finances running low, Rudy tried everything to convince himself to not give up. There had to have been days and nights where the constant grind of outworking everyone else, getting up at five o’clock in the morning for workouts, ensuring your classwork was topnotch — then still being told there was no room on the squad for a scholarship caused Rudy to seriously consider hanging it all up. And even if that was the case, and there were those days — Rudy went to a place of comfort. A story that inspired him for years, and was so fitting for his current situation — Rudy went to his favorite DVD and watched it constantly on a daily basis. That’s right, “Rudy” the story of the boy who wanted to play for Notre Dame so bad he sacrificed almost everything he had. The story about a boy who was told his entire life he was too small, too slow, too stupid to play collegiate football and get an education from a school like Notre Dame. Every time Griffin had a feeling of hopelessness, he turned to this movie, and the inspiration was enough to continue to persevere — even if it was just for one more day. Just like the movie, Rudy eventually got his big break. Desperate for an opportunity and fearful of not ever getting his recognition, he received a call right before Christmas from Coach Shula informing him that his hard work indeed paid off and he would receive a scholarship for the spring semester of 2004. Jubilation could not be put into words for Rudy as he got the news he was praying for. However, for Rudy, the job was not complete. It wasn’t enough to earn a scholarship for a semester. He knew he had the spring to prove himself and be placed on full athletic scholarship for the duration of his time at Alabama. With a new opportunity, Rudy did not disappoint and he indeed earned that scholarship and was given the starting job to open the season in 2004. Every athlete always has those career defining moments. For some, a walk-off home run in the World Series is enough to catapult a player into instant legend status. A game-winning shot at the buzzer to win a state championship is enough for the kid who only was considered a role player — but now a hero. For Griffin, his moment came in 2005 when an Alabama team who was thought by many to have the best defense in college football was struggling to find offense after sustaining terrible injuries to key players earlier in the season. The moment — which lasted only but a few seconds in game time — has actually lasted a lifetime for Rudy. The play was a testament to his story and highlighted why he left The Citadel in the first place. Unbeknownst to Rudy, there was an opposing coach who wanted to shake his hand after the game. After being prompted to wait around for a second by a Mississippi State staffer, Rudy saw a familiar face approach him and congratulate him. That face was former Citadel head coach and then Mississippi State defensive coordinator Ellis Johnson. 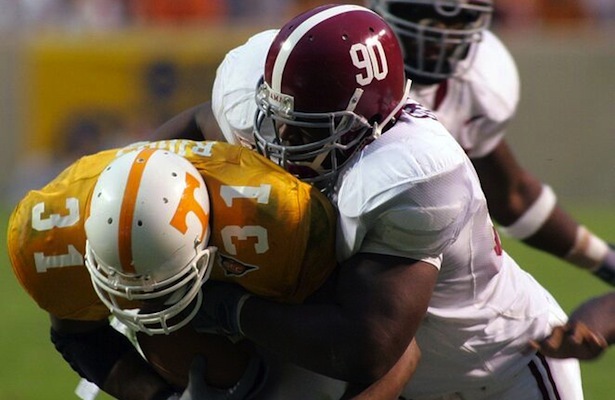 Even in defeat, Johnson had to let his former player know he made the right decision and he was wrong all along about whether the undersized lineman could make it at Alabama. On that day, Rudy finally got his validation. As Rudy’s college career came to an end in 2005, he may not have gotten carried off the field like Ruetigger, but to be named a captain in his final game of the season was the ultimate testament of accomplishing a goal that his teammates and coaches thought enough of him to represent the team he grew up rooting for in one of the biggest games of his life. Today, Rudy has settled down into a career that gives him great satisfaction. After coaching on the collegiate level for years, he found a home with the Hewitt-Trussville Huskies high school football team as the defensive coordinator as well as a Community Relations Coordinator for the school district in which he handles all public relations dealings. Coaching football for Rudy is his way of giving back. He also spends time as a motivational speaker, is active in his church, and has a passion for mentoring kids which he believes is his calling. He loves his family which consists of his lovely wife Kimiko, and their four children Kimari, Kai, Genesis, and Amelie. Rudy is more than satisfied with his life. While his story may not draw the interest of Hollywood, the script that inspired him was enough to afford him the life he has led. Coincidently, he and Ruetigger are friends and still stay in touch to this day. The underdog story never gets old. It’s stories like this that continue to make believers out of those who never had a reason to believe. Stories such as this give hope to the hopeless and joy to the ones who understand the tough road travelled. Rudy is the ultimate testament to this. And to those who still have doubts about their dreams; don’t tell Rudy that dreams don’t come true. Brandon Williams is an Editor and Columnist for Touchdown Alabama. You can follow him on Twitter, @BWilliamsTDAL, “Like” him on Facebook, or add him to your network on Google.